Hugh Clutterbuck is affectionately recalled in Wings Over Olympus as “Buttercluck”: one of the many nicknames then the token of Squadron camaraderie. Having been posted to Egypt and No 4 FTS Abu Sueir in August 1939, Hugh had joined 211 Squadron as Flying Officer from August 1940, and went with them to serve in the Greek campaign. By October 1940, Clutterbuck had seven operations to his credit in the Western Desert, adding at least another 20 in Greece. Later posted to 84 Squadron in Iraq, he subsequently rejoined 211 Squadron as a Flight Lieutenant in December 1941, for the 1942 Far East campaign. 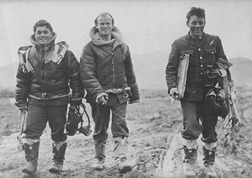 Unnamed WOp/AG (probably Sgt Duffy) left, Hugh Clutterbuck (pilot) centre, unnamed Observer right (Sgt Bill Stack). This photograph caught the eye of Alan Stack in the UK: it is indeed his father Bill Stack on the right. As it happens, the shot also solved another small puzzle. As we have already seen, 211 Squadron’s part in the Greek campaign was recorded by The Sphere illustrated weekly in its May 1941 article, The Men Who Fought For Greece. The carefully worded story included a previously unidentified, cropped version of the same shot. In the background mist, the hills look more like Parnes than Paramythia: so possibly Menidi, late 1940. Thanks to the kindness of his nephew Michael Bell, we can now see this official print of Hugh Clutterbuck and his crew, safely returned from an operation in Greece. The family keep his RAF Log Book safe, still. Posted to the Far East with 211 Squadron and 5 other veterans of the Greek campaign, he was at Helwan in early 1942 as the Squadron was re-gathering itself for the big move to the East Indies. On 9 January 1942 it was apparently Hugh Clutterbuck who, revisiting an earlier 211 Squadron custom, flew out to Gambut to collect their new CO, Bob Bateson DFC. Bateson flew the return leg himself: two veteran Blenheim pilots with a deal of operational experience, and a chance to size each other up. Hugh Clutterbuck died at P2 (Palembang) in Sumatra, in the terrible attempted night attack of 11/12 February 1942 against the Japanese landing force then North of Banka Is. On this operation, no less than three aircraft were lost on take-off: two of 211 Squadron and one of 84 Squadron. “The place was not only almost invisible but also almost inaccessible. Apart from the lack of road communications, there was no nearby town or market to supply a thousand or so men with a variety of fresh food, so we had to subsist largely on tough zebu meat, rice, and pineapples from a nearby plantation. We lived in wooden huts fitted with double-decker bunks, four of us to a tiny room, about a mile away from the field where our aircraft were secreted in jungle alcoves. The station commander was an Australian, Group Captain McCauley, with whom I happened to have a personal contact through his wife; her youngest brother had been a close friend in my pre-Solomon days and I had often stayed at the family home on the lake shore at Belmont just off the Sydney road. In his determination to preserve the secrecy of the airfield, McCauley had created some interesting problems for the pilots. Apart from having to tuck our aircraft into jungle alcoves and cover them with branches, we were forbidden to circle the site, which meant we had to land down-wind if we happened to arrive from that quarter, so the extreme length of the field was sometimes useful. Night flying had special complications. Once you started the engines you had to send a runner to the control hut to check there were no enemy aircraft in the vicinity, and when he returned with the go-ahead you then taxied lightless to the take-off point. There you switched off your engines, so enabling the night-flying officer to listen for presence of any enemy aircraft. If sonically satisfied that all was clear he then gave you a green to restart the engines. In principle this should have resulted in the flare path appearing; there were ten airmen stationed down the length of the field and when you were given the green light the first man lit his hurricane lamp. He held this aloft for a moment so the next man down the line could see it, light his lamp and follow the same procedure, and so it continued down the line. Once all these matches had been struck and lamps lit you had a line which, although it could not be seen in totality, you could pick up piecemeal as you headed down the field, so enabling you to keep the aircraft more or less aligned till airborne. There were two snags. The field was not flat but convex, so if one lamp-lighter happened not to see the waving signal then he could break the chain, for some lamps when lowered to the ground were not visible to a man standing a hundred and fifty yards away. Secondly, the frequent squalls of rain that swept across the field would often prevent the visual signal being passed. The consequences of such broken chains could be stimulating. We roared over the central hump one cloudy night to be faced with complete blackness, the last five lamps were unlit. I had instantly to switch vision from outside to inside, no jabbing of rudder in search for the remaining lights but eyes straight down to the gyro compass with a prayer that it had settled. Fortunately it had, it got us safely through the trees in the waist of the field, then up into the cloud-filled sky when I let out a whistling breath of relief. The story of the night attack has been recounted in varying detail by other participants and witnesses, as recorded in Hugh Campbell and Ron Lovell’s So Long Singapore p76, in Bon Hall’s Glory in Chaos p414, in Don Neate’s 84 Squadron history Scorpion’s Sting p55, Shores, Cull & Izawa in Bloody Shambles p74, and in David Vincent’s RAAF Hudson Story p107. If recall of the order and detail of these grim events differs, no matter. In summary, the casualties among the Blenheim IVs were as follows. Z7521 of 211 Squadron was crewed by Clutterbuck, Newstead and Joerin. The aircraft clipped trees on take off then broke in half on impact but somehow the gunner Joerin, ribs broken, survived. Z9649 also hit the trees but the 211 Squadron crew (F/O Bev West RAAF, with two more Greece veterans Sgt Gordon Chignall and Sergeant Jimmy Riddle) all survived, albeit injured. Z9726 In the 84 Squadron aircraft, the all-RAAF crew were Sgts Hyatt, Mutton and Irvine, Irvine as rear gunner again the sole survivor. Among the 211 Squadron references in the Imperial War Museum on-line catalogue is an entry for Hugh Clutterbuck’s letters to his parents for the period May 1939 to December 1941, together with other papers including the Air Ministry telegram sent to his family in 1942. Son of Medwin Caspar Clutterbuck and Florence Emma Shrapnell Clutterbuck, of Brighton, Sussex. Grave Reference/Panel Number: Column 412.